What is the Grab-O-Matic Drum Handler? Grab-O-Matic Drum Handling attachments are suitable for use on all steel open top and tight head drums, plastic ‘L’ ring drums and most fibre board drums. They can be fitted to most fork trucks in seconds, without electric or hydraulic connections, and are connected to the forks with zinc plated ‘T’ bolts. 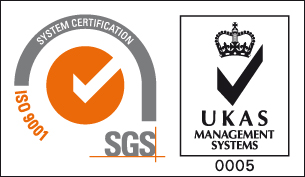 All frames and pillars are made from 6-12mm steel and all parts are manufactured entirely in the UK to ISO 9001:2008. 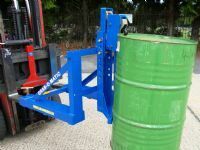 A single drum handling attachment (model 1-DLR) can be converted to a double drum handling attachment (model 2-DLR) with the addition of a pillar and gripping head. What is the Quick Release System and how does it work? The quick release system improves safety and reduces the risk of accidents by preventing the requirement for the fork truck driver to dismount from the cab. In addition it eliminates the need for the driver to secure the drum grabs to the forks with either ‘T’ bolts or chains thus saving valuable time. It works by bolting a carriage hook plate to the centre of the fork truck carriage. The carriage hook plate stays in place permanently as it does not interfere with the normal lifting and moving of pallets and is only 300mm wide. When the forks are inserted into the fork pockets of the drum handling attachment, and then raised, a sprung loaded lever locks behind the carriage hook plate. This lever is only released when the attachment is lowered to the ground allowing the forks to be withdrawn from the attachment pockets. All the Grab-O-Matic range of fork attachments can be manufactured using the Quick Release System. The Quick Release frames are universal with all current Grab-O-Matic pillars and gripping heads, allowing for a safe, efficient and secure way of attaching the Grab-O-Matics to any fork truck. Bespoke items can also be made to suit your specifications in both powder coated and stainless steel. All we require is the size, type of carriage on your trucks and the length, width and thickness of the forks.